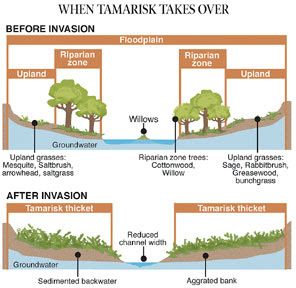 The fight against invasive tamarisk continues, with an emphasis on what happens if we don't. Today, the tamarisk are consuming about 58,600 acre-feet of water - 19 billion gallons - annually, but the number will grow to nearly 130,000 acre-feet annually - one-fifth of the water in the river in an average year - when the plants completely take over and grow larger. The cost to remove the tamarisk is estimated to be $44 million to $67 million, or about $600-$1,000 per acre-foot of recovered water.